The software allows you to load your Inventory from your account and lets you edit minimum price in Excel/CSV format. 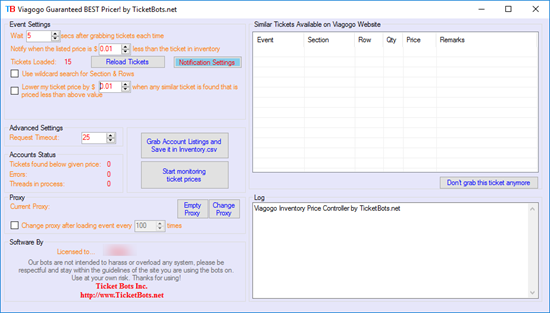 It then monitors the events for which you have tickets in your inventory and will notify you whenever there is any similar tickets available at a competitive price, you have set. It will also notify you whenever the price of similar tickets that are found on Viagogo website is below the given percentage of price. It also allows you to automatically decrease your ticket price just below the similar ticket listed on Viagogo. In this way, you can set the cheapest and BEST prices of your tickets to sell on Viagogo. On the other hand, if other similar tickets are being sold at a much greater price than your ticket, it can also adjust your price to match those price but still being the cheapest in the list. In short, the bot continuously monitors events that are on Viagogo to look for tickets similar to tickets in your inventory and notifies you whenever there is any ticket available in less price than yours and edit your ticket price accordingly as well. Please let us know, which country's website you want to activate your license for after purchasing via Email or offline/online chat message (bottom right on this page).